FNZ Type Zinc Clip-on Wheel Weight Coated 10g BOWES WW FN010Z Box of 25. 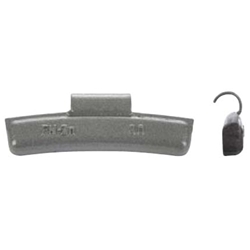 The FNZ-Series zinc clip-on wheel weight is used primarily on most Japanese vehicles equipped with alloy wheels that were manufactured prior to 1990. Please refer to Application Guide (Part # 18082NL) and use rim gauge (RGP1) to verify specific applications.